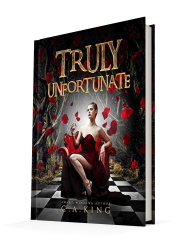 Truly Unfortunate is a quick read for a novel, a tale about the weird and unusual in one small town following Truly, a girl who works three jobs and still is unable to make ends meet with a landlord who harasses her at any given moment. It is a relatable read, following Truly on her day to day excursions as she goes from job one to the next as she struggles to make ends meet, suffering the injustices that surround her. However, the kicker in all this, what makes this story, so riveting is the fact that it goes back in time, flashing back to the memories Truly had forgotten, memories of abuse and bullying. That is the power of the novel that injustices happen, that bad people are going to do bad things but that there is some karmic justice in the world to make everything right. Once again, it is a short read at just under 200 pages, making it a quick one, but that is not all that makes it a quick read. The fact that the novel moves so effortlessly to build the tension and the intrigue keeps the reader on their toes. Other than that, Truly is a pretty forgettable character, her history and origins are what make her stand out, but her personality, nothing about it stands out. Jeff, on the other hand, his obsession with the weird and the connections he makes to fortune telling, now his actions and reactions, that is what makes him appealing to read. His motives and the way his arc in the narrative moves and intertwines with Truly’s from the past to the present, that makes him interesting. Overall, it is a good read, and as a starter to something bigger, it works.